Tangled and True: thank you williams-sonoma. A couple of years after Brad and I were married, I discovered that he was an amazing "dessert chef." It's true. And it all came about when he decided he wanted a creme brulee torch for his birthday. My parents not only fulfilled his request, but bought him the ramekins, pure vanilla bean paste, Nielson-Massy vanilla and a cookbook of various dessert recipes. He loved taking advantage of his gift, practice boosted his confidence, and now he is known as the family's dessert cook. (including special requests when we all get together.) I think it's a pretty fancy quality in my husband that I would have never guessed. I found this recipe today. Doesn't bing cherry cobbler sound like a perfect treat? I love cobbler. And maybe I'll have to treat the dessert chef with something I've created come mid-February. Cobblers call for a biscuit topping baked over fresh fruit. The dough beneath the crisply baked surface stays tender over the warm, cooked fruit. This recipe uses a soft biscuit dough that spreads as it bakes to cover the fruit completely. Cold heavy cream, whipped cream or ice cream makes a good accompaniment to the warm cobbler. 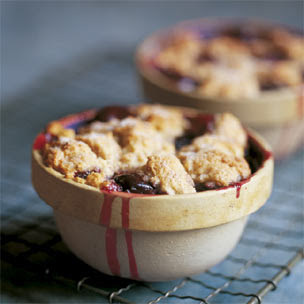 Nearly any fruit can be used for a cobbler, and the juicier it is, the better. If you are lucky enough to catch the very short season for sour, or tart, cherries, by all means use them, adding more sugar to taste. Blueberries, peaches, berries with peaches, apples, pears, cranberries, rhubarb or rhubarb with strawberries can bake you through a year of cobblers. Use the same dough for the topping with about 5 cups of any of these fruits. Sweeten the fresh fruit to taste, then add lemon juice, if desired, and any appropriate spices or grated citrus zest. Preheat an oven to 375°F. For individual servings, place six 1-cup ramekins or custard cups on a rimmed sheet. For a large cobbler, have ready a 9-inch glass or ceramic pie dish or baking dish with sides at least 2 3/4 inches high.To make the filling, in a large bowl, stir together the cherries, lemon juice and sugar until well mixed. Divide the fruit among the ramekins or pour into the pie dish or baking dish. Bake the fruit for 10 minutes while you prepare the topping. To make the topping by hand, in a small bowl, stir together the buttermilk and vanilla; set aside. In a large bowl, sift together the flour, sugar, baking powder, baking soda, salt and cinnamon. Using a pastry blender or 2 knives, cut in the butter until the mixture forms large, coarse crumbs the size of small peas. Pour the buttermilk mixture over the flour mixture and, using a large wooden spoon, stir just until combined and a soft, sticky, evenly moistened dough forms. To make the topping with an electric mixer, in a small bowl, stir together the buttermilk and vanilla; set aside. In the bowl of a stand mixer fitted with the flat beater, sift together the flour, sugar, baking powder, baking soda, salt and cinnamon. Add the butter pieces. Beat on low speed until the mixture forms large, coarse crumbs the size of small peas, about 30 seconds. Slowly pour in the buttermilk mixture and continue to beat just until combined and a soft, sticky, evenly moistened dough forms. Drop the dough by heaping spoonfuls onto the hot fruit, spacing it evenly over the surface. The topping will not cover the fruit but will spread during baking to cover it. Sprinkle the cinnamon-sugar mixture evenly over the dough. Bake the cobbler until the fruit filling is bubbling, the topping is browned, and a toothpick or cake tester inserted into the topping comes out clean, 30 to 35 minutes. Transfer to a wire rack and let cool for 15 minutes. Serve warm. Serves 6. Oh yum. That looks divine. I love that Brad is a dessert chef. Creme Brulee torch and all. That is fantastic. What a great quality for you to be surprised with. Did you get this out of Rachel Ray too? I never knew she had a magazine. I really like good/gourment food and sometimes I really enjoy cooking extravagant meals. Most of the time I like to keep it simple though. This is an area in my life (cooking) I definitely want to get better at. Ooh, cobbler is my favorite. It's so yums. Sundance has the best cobbler. Have you gotten it before? Only problem is that I don't like cherries. Do you think I could substitute it for blackberries? Probably right? I totally want to make this for Valentine's. I think I will. You are gourmet Kelli. Food or not. You are purely gourmet. I like that. I was going to say the same thing as Missy, I don't like cherries but do it would probably still be delish with raspberries or strawberries right? If you guys try it, let me know how it turns out.